A crunchy, colorful salad gets a kick from spicy gochujang dressing. 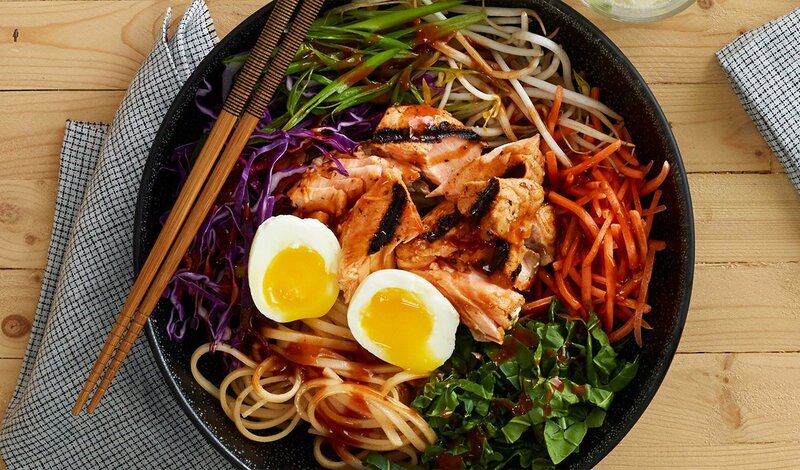 Topped with grilled salmon and a soft boiled egg for a perfect meal bowl. Combine ingredients and whisk until combined. Combine the gochujang paste, tamari, mirin, scallions, garlic, sesame oil, sugar and lime juice, whisk until uniform. Marinate salmon filets for 30 minutes. Combine rice noodles with a small amount of Gochujang Dressing. Top noodles with bok choy greens, bean sprouts, carrots, cabbage, scallions, 3 oz of Grilled Marinated Salmon and an egg. Drizzle salad bowl with additional Gochujang Dressing.